Tragically, 1.4 million die from lung cancer each year, with 1.6 million newly diagnosed. Could the humble noni leaf extract offer a more effective cancer treatment than a drug that can cost over 100,000 dollars, and improves lung cancer survival rates by only a few months? 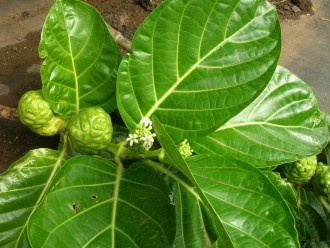 A promising new study published in the journal Food & Function titled, “Morinda citrifolia edible leaf extract enhanced immune response against lung cancer,” has found that an alcohol-based leaf extract of the noni tree (Morinda Citrifolia) was more effective than a commonly used chemotherapy drug in treating lung cancer in an animal model. In the new study, a team of Malaysian researchers tested the relative effectiveness of the drug erlotinib (trade name Tarceva), a so-called epidemal growth factor receptor inhibitor (EGFR inhibitor), to a noni leaf extract, in lung tumor-induced albino house mice (BALB/c), and found that 21 days of treatment with a 300 mg kg-1 body weight of leaf extract was more effective suppressing lung tumour growth than a 50 mg kg-1 body weight erlotinib treatment. – Inhibited the mechanistic target of rapamycin (MTOR)) mRNA expression in the tumors. Not mentioned in the study, but highly relevant to the topic at hand, is the extraordinarily high cost of chemotherapy drugs like erlotinib, despite the relatively small gains they produce. Clearly, if the results of this latest animal study are found to extend to human lung cancer, as well, noni leaf extract could provide an ideal alternative, and could be produced at a much lower cost (A quick internet search yielded a price of about $50 for 12 ounces). Scopoletin, ?5 sterol ?-sitosterol, ?5,7 sterol campesta-5,7,22-trien-3?-ol, (+)-catechin, ?-ionone, ?-carotene, ?-ionone, ?-sitosterol, 1,2-dihydro-1,1,6-trimethyl- naphthalene, 1,5,15-trimethylmorindol, 2,6,10,14,18,22-tetra- cosahexaene, 2-methyl- 3,5,6-trihydroxyanthraquinone,2-methyl-3,5,6-trihydroxyanthraquinone-6-O-?-D- xylopyranosyl- (1–6)-?-D-glucopyranoside, 3-hydroxymorindone, 3-hydroxymorindone 6-O-?-D-xylopyranosyl-(1–6)-?-D-glucopyranoside, 3-O- acetylpomolic acid, 4-(3? (R)-hydroxybutyl )-3,5,5-trimethyl-cyclo- hex-2-en-1-one, 5,6-dihydroxylucidin, 5,6-dihydorxylucidin 3-O- ?-D-xylopyranosyl-(1–6)-?-D-glucopyranoside, 5,15-dimethyl- morindol, 5,15-DMM, 5-methylfurfural, 5-benzofuran car- boxylic acid-6-formyl methyl ester, 6,10,14-trimethyl-2- pentadecanone, 13-epi-phaeophorbide a methyl ester, 13- hydroxy-9,11,15-octadecatrienoic acid, 132(R)-hydroxypheo- phorbide a methyl ester, 13(S)-hydroxypheophorbide a methyl ester, 151(R)-hydroxypurpurin-7 lactone dimethyl ester, 15(S)- hydroxypurpurin-7 lactone dimethyl ester, alanine, arginine, aspartic acid, asperuloside, asperulosidic acid, aucubin, barbi- nervic acid, benzaldehyde, benzeneacetaldehyde, campesta-5,7,22-trien-3?-ol, campesterol, citrifolinin A, citrifolinin A-1, citrifolinin Ba, citrifolinin Bb, citrifolinoside A, citrifolinoside B, citrifoside, clethric acid, cycloartenol, cysteine, cystine, de-acetyl asperuloside, deacetylasperulosidic acid (DAA), E-phytol, epicatechin, geranyl acetone, glutamic acid, glycine, hedera- genin, histidine, isoleucine, kaempferol, kaempferol-3-O-?-L- rhamnopyranosyl-(1–6)-?-D-glucopyranoside kaempferol 3-O- ?-D-glucopyranosyl-(1?2)-?-lrhamnopyranosyl-(1?6)-?-D-galac- topyranoside, ketosteroid stigmasta-4-en-3-one, leucine, lino- leic acid, lucidin, lucidin 3-O-?-dxylopyranosyl-(1–6)- ?-D-glucopyranoside, methionine, methyl oleate, methyl pheo- phorbide a, methyl pheophorbide b, methyl plamitate, nicoti- floroside, oleanolic acid, oxalic acid, palmitic acid, peucedanocoumarin III, phenylalanine, pheophorbide a, phytic acid, phytol, proline, pteryxin, quercetin, quercetin-3-O- ?-L-rhamnopyranosyl-(1?6)- ?-D-glucopyranoside, quercetin 3-O-?-D-glucopyranoside, quercetin 3-O-?-D-glucopyranosyl- (1?2)-?-lrhamnopyranosyl-(1?6)-?-D-galactopyranoside, roseo- side II, rotungenic acid, rutin, scopoletin, serine, stigmasta- 4–22-dien-3-one, stigmasta-4-en-3-one, stigmasterol, tannic acid, threonine, triterpene cycloartenol, tryptophan, tyrosine, ursolic acid, and valine. The evidence demonstrated that the epicatechin and scopoletin rich M. citrifolia leaf extract may be used as a functional food and complementary therapy to suppress lung cancer by stimulating the immune responses and modulating multiple cancer cell gene signaling pathways against cancer cell proliferation and towards apoptosis, without producing detectable undesirable effects. The extract suppressed key inflammatory markers and inhibited various molecular and cellular markers involved in proliferation and angiogenesis, suggesting a mode of action targeting, as proposed in Fig. 6. The epicatechin and scopoletin rich M. citrifolia leaves may be used as a complementary/adjunct therapy or functional food to help fight lung cancer or adenocarcinoma”. In 2012, the Indian Journal of Molecular Medicine published a study which found that noni fruit juice down-regulated an inflammatory process within human lung cancer cells, indicating it might play a therapeutic role in inflammation-associated lung pathologies, including but not limited to lung cancer. In 2001, the Annals of the New York Academy of Sciences published a study that found noni fruit juice was capable of preventing carcinogenic DMBA-DNA adduct formation in the lungs of mice, indicating its likely cancer preventive properties. In 1999, the journal Phytotherapeutic Research published a study which found that the fruit juice of noni had antitumor activity in a mouse model of Lewis lung cancer. It should be emphasized that the noni tree is certainly not the only natural substance that has been studied to provide natural chemopreventive and chemotherapeutic activity against lung cancer. Indeed, we have indexed 129 additional natural substances, many of which are foods, that have demonstrable anti-lung cancer activity. Curcumin, since it is able to target the cancer stem cells at the heart of lung cancer malignancy, may be the most promising of them all. Learn more about cancer stem cells, how chemotherapy and radiation can actually enrich them, and curcumin’s cancer stem cell targeting properties. For additional research on the health benefits of noni, view our research database on the topic: Noni health benefits research. Lastly, consider that lung cancer is one of the most commonly overdiagnosed and overtreated cancers in existence today,as identified in an important 2013 JAMA report commissioned by the National Cancer Institute. So, please always get a second opinion and do your own research so you can make as much of an informed choice as possible.